At 7:00 am the Baja Fleet left Bahia Santa Maria quietly and colorfully. Many boats flew spinnakers thru the light early morning breeze. Our final leg, and next landfall, is Cabo San Lucas, 180 nautical miles down wind. The winds are light and everyone is tired. We mostly motored, mostly close together, comrades now after our shared adventure. The tranquil, sunny morning was soon interrupted when Alex, Krista and Peter began again to slay the fish. I think they had 3 tuna and 3 Mahi Mahi caught, killed, gutted, filleted, packaged and placed in the refrigerator in time for lunch. For lunch I sliced the tuna fillet into long thin strips sautéed 4 or 5 pounds in butter and garlic. I shredded cabbage and diced fresh lime for tacos de pascado. Mmmmm, tasty! About 4:00 pm, we were all lounging comfortably in the sunshine, lost in private thoughts, when that damn fishing reel squealed the announcement of another fish! It was a long, grueling battle, man against beast, but Alex came out victorious again. Peter got to use his tailer for the first time. 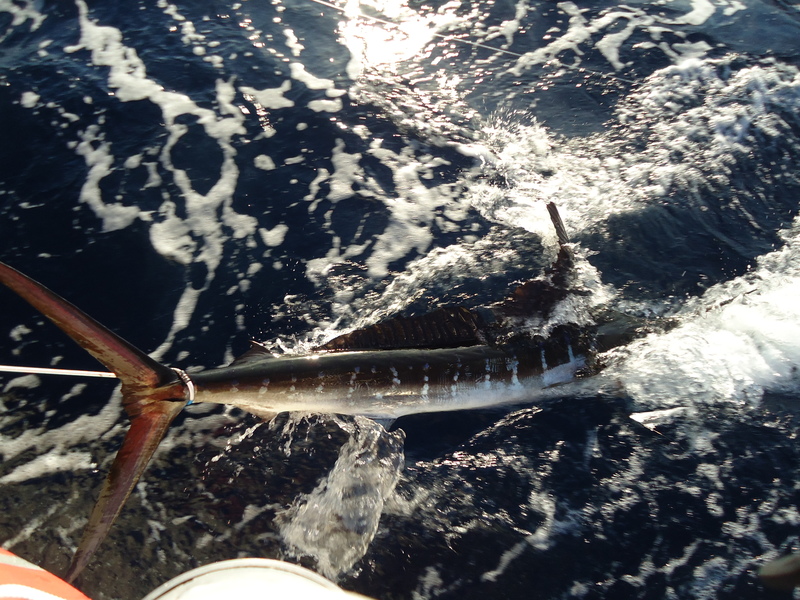 Soon a 100 pound marlin was being drug, tail first, with a $2.95 bicycle cable lock. This time the guys had to call on the assistance of the spinnaker halyard to get our fish in the boat.